At tonight’s school board meeting , the district announced a $4 million surplus for the year ending June 30, 2015. They actually announced a $3.5 million surplus but that’s after they subtracted $250,000 that was put into the fund balance retention fund and another $250,000 that was put into the capital reserve fund. Yes, all this on a default budget! Dr. Metzler praised his staff for running a tight ship. Or, the district is flush with cash and was scaremongering at Deliberative. You choose your version of reality. The board also decided to urge Josh Horns of Danville to resign one of his public positions. (He is in his second year on the Timberlane Budget Committee, and was recently appointed to the Danville Board of Selectmen). This was announced after an illegal non-public called on reputation and litigation. I pray that Mr. Horns stands up to this, and blazes a path for competent people to populate both the Boards of Selectmen of our towns and the school district’s board and budget committee. From your experience last year, I believe with TRSB, you know better than to try and contact the SAU55 or TRSD auditor. They will not be returning your call. The Board, as a whole, can discuss issues with the auditor should they decide to do so. I cannot allow one member to act for him/her self in contacting them. My suggestion is to allow the SAU Board to meet, if the Board is unsatisfied with Mr. Stokinger’s report of the audit, then bring up a vote to have the auditor come in. Do be aware that the auditor charges $165 per hour, including transport time of approximately 1 hour each way, during business hours for a consultation, they may (I do not yet know) charge more for evening visits. Just my suggestion. I feel like I am living in North Korea. I knew he wouldn’t return my call. The fee is insignificant given the amount of money we are responsible to the taxpayers for. The district has paid in the order of $4000 for needless “training” but balks at a few hundred dollars to explain an unfavorable audit. If Mrs. Steenson can sign contracts without board authorization, I see no reason why you can’t have the auditor present for an SAU meeting on your own initiative, but I know that initiative works only in the SAU’s favor and never in favor of transparency or the taxpayers. Mr. Bealo should have learned from “my experience” last year that it is counterproductive to try to censure me. Let’s be clear in all this. Mr. Stokinger and his staff are the ones being audited. We have an adverse opinion and we need to hear what that means from the professionals we are paying to give us their opinion – not from the people whose work is being audited. Here is the email I sent to the auditor this afternoon asking for explanation. The adverse opinion this year is stronger than that of last year. This year you state that the the financial statements referred to above do not present fairly the financial position of the government-wide financial statements of the School Administrative Unit No. 55, as of June 30, 2014, or the changes in financial position thereof for the year then ended in accordance with accounting principles generally accepted in the United States of America. How are the “government-wide financial statements” different from the government activities statements and what is the significance of the change in language? SAU 55 is overexpending its appropriated budget and covering the overexpenditure with an unassigned fund balance from the previous year. I thought the only way an unexpended fund balance from the previous year could be used was via an encumbrance; otherwise, all the previous year’s “surplus” must be included in revenue. You seem to indicate otherwise in your Note 2A so your help would be appreciated in helping me understand the significance of your findings. What is the significance of the restatement with respect to the compensated absences from the previous year? Is this a common occurrence? In so far as it affects the deficit position of the SAU, this does concern me. Basically I’d like some background on all the notes. I will be contacting the Department of Revenue Administration in Concord tomorrow. Mr. Bealo, you are welcome to put in a preliminary call to them first to tell them not to speak to me. Linked below you can view the latest legal filings by the towns of Sandown and Danville asking the judge for a reconsideration and clarification of his decision. Below you will also find the public and non-public minutes of the Sandown Board of Selectmen wherein they discuss continuing the legal suit against the Timberlane Regional School District. These documents were all made available by the Sandown BOS office. The TRSD has not informed the school board of this latest development. Linked below are the just released 2014 SAU 55 audit as well as Timberlane’s 2014 audit. As discussed in Note 9 to the financial statements, management has not recorded the long-term costs of retirement health care costs and obligations for other postemployment benefits in the governmental activities. Accounting principles generally accepted in the United States of America require that those costs be recorded, which would increase the liabilities, decrease the net position and increase the expenses of the governmental activities. The amount by which this departure would affect the liabilities, net position, and expenses on the governmental activities is not readily determinable. In our opinion, because of the significance of the matters described in the “Basis for Adverse Opinion on Governmental Activities” paragraph, the financial statements referred to above do not present fairly the financial position of the government-wide financial statements of the School Administrative Unit No. 55, as of June 30, 2014, or the changes in financial position thereof for the year then ended in accordance with accounting principles generally accepted in the United States of America. This is exactly the same issue behind Timberlane’s adverse opinion, as well. I have asked repeatedly for the auditor to be present at a TRSB meeting to explain the significance of these statements but the SB chairman will not do so. Today I sent an email out to a few Hampstead SB members asking them to request of the SAU chairman that the auditor be present at our next SAU meeting. I’m not a betting person but I’m willing to wager they will have no better success than I. Taxpayers should be asking why board members who have an obligation to protect your money and see that it is justly spent and fairly accounted for are restricted from talking to the auditor privately and thwarted from questioning her in public. P.S. Yesterday I placed an official Right to Know request with the SAU to see the multi-year lease contract for the photocopiers mentioned in Timberlane’s audit. I had requested to see this contract two months ago. As my faithful readers know, RSA requires multi-year contracts to be approved by voters unless they contain a non-appropriation clause. Two outstanding Eagle Scout projects were dedicated in Sandown this week. Both were at Sandown North Elementary School, a hive of activity these days. 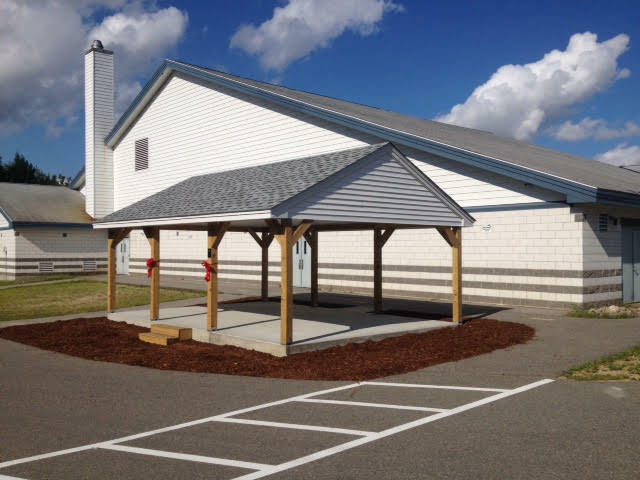 On Sunday, Cody Sears conducted a dedication ceremony for a shade pavilion he designed and built with the generous assistance of two well-known contractors in town, Hans Nicholaison and Paul D’Amore. Roofing materials were also donated. The quality of the construction is outstanding with perfect siting. It will be well used by teachers for outdoor classes and many other functions certainly. The district attractively mulched around the structure and provided steps and a ramp up to it. 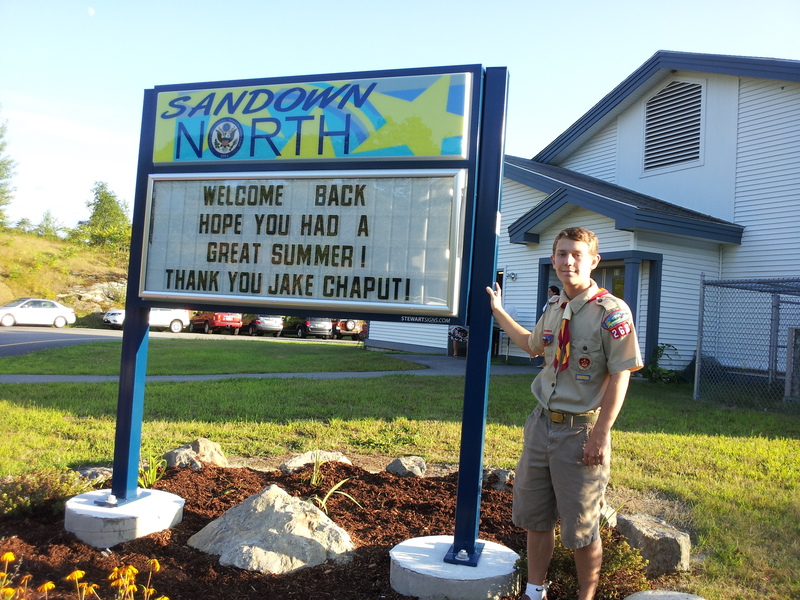 Yesterday during the bustling open house at Sandown North, Jake Chaput dedicated a new school sign that will allow more messaging – not to mention being a whole lot snazzier. Sandown has benefited from an extraordinarily high number of Eagle Scouts which is a tribute to the scout leaders of our community, parents and their hardworking, community-minded children. The school district is thankful for their tremendous contributions and we can all be very proud that these young people are among us and selected their former school as the site of their lasting contribution. Cody and Jake, jobs very well done. Thank you! As a side note, the school itself looked cheerful and beautifully maintained at the busy open house yesterday. 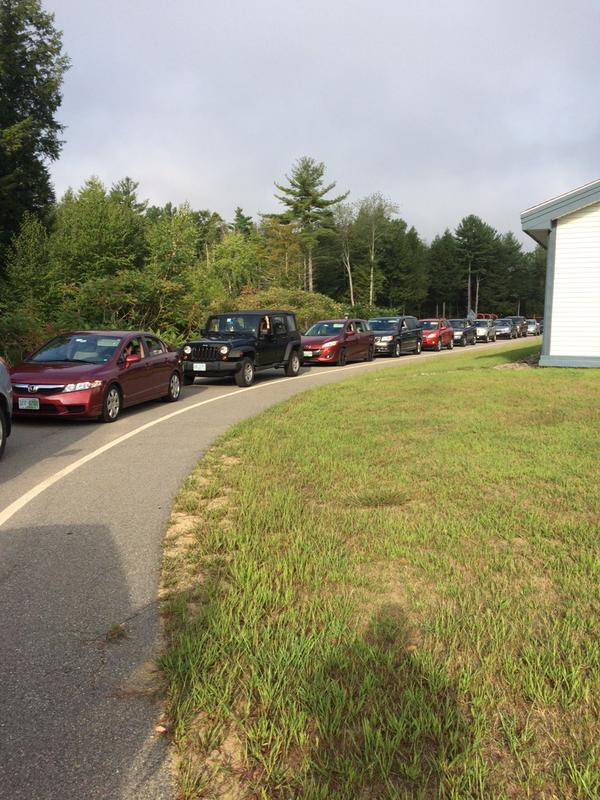 The enthusiasm for a new school year was evident in every smiling face and in the many creative preparations teachers had made to welcome their new students.